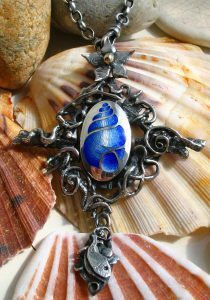 Champlevé is an enamelling technique made by the process, in which cells are carved into the surface of a metal object, and filled with vitreous enamel. The recessions in metal is then fired until the enamel fills the cell, after cooling the surface of the object is polished. The un-carved portions of the original surface remain visible as a frame for the enamel designs. There are several ways to achieve the technique of Champleve. 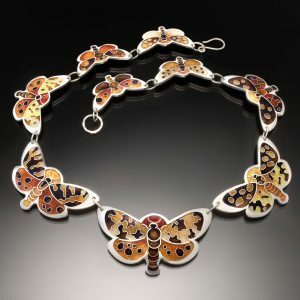 And as most enameling projects the metals used are commonly copper, brass, gold, and silver. 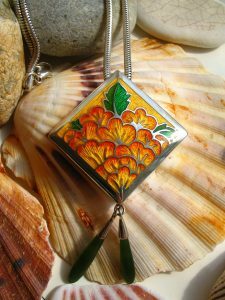 Each has the same properties of enameling as in any other enameling technique, it is just the preparation of the metal that is different. One can carve or grave out the recessions. Without engraving skills an enamelist can apply asphaltum varnish to the metal that is designed to be left as the positive space. And place the metal of copper and sterling silver or fine silver in sulfuric acid and the acid will slowly remove the un-wanted metal. Leaving a recession to place enamels. Some enamelist use the process of depleting two sheets of sterling silver with the use of heating to 800 degrees and dipping in a pickle bath, repeated time to create a fine silver surface. This allows the artist to fuse the two sheets together. The top sheet prior to fusing is saw pierced out in a desired design. Again the negative space is left to enamel. And a couple of excellent samples of champleve enamelist! I just had a look at your website. Great stuff! I like your work too! For the last 15 years, I have trained and worked as a jeweller in London, UK and I am still constantly seeking to improve my skills and broaden my knowledge. 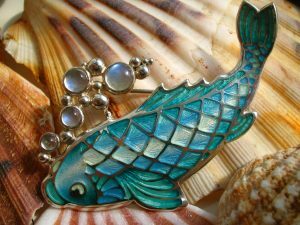 I studied jewellery making and enamelling at the Sir John Cass School of Art and Design in London, where I was fortunate enough to be taught by a number of extremely experienced and skilled crafts people, which was a fantastic experience and inspired me to progress in this field. 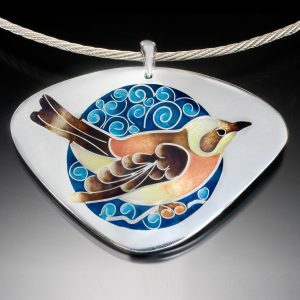 I specialized in enamelling and was accepted as a full member of the British Society of Enamellers in 2005. My work has been on show and for sale in a number of exhibitions in the UK and Germany. I currently teach at a Jewellery Academy in Hatton Garden, London’s Jeweller’s Quarter. 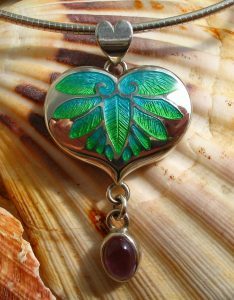 To me, enamelling is one of the most beautiful kinds of jewellery decoration. I find it fascinating how layers of fired glass can create intensity of colour and depth to a degree which otherwise can only be achieved by gemstones. Figurative subjects inspire me. I try to get close to the appearance of the real object in shape and colour but sometimes also take it one step further to give my pieces a certain twist. 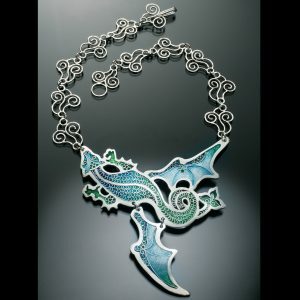 In terms of techniques, I like making use of the possibilities of photo etching and cloisonne, as it allows me to create very intricate areas on which to apply the enamel. Many of my pieces incorporate Champlevé, because the light reflection from an engraved background enhances transparent enamel colours beautifully and makes them shine. I love using the techniques of fusion and reticulation in my work, especially together with enamels. This brings out the contrast between the bright, colourful and accurate enamel work and the dark, more random and “dug-up” look of the fused silver. I often use scrap pieces of metal for my fusion projects and create new shapes. It sometimes takes a while until I find the right enamel pieces to go with a particular fused setting. I like to oxidize and partly polish the fused/reticulated surfaces as it brings out their uneven texture really well. I hope what I’ve written is useful for your website. I’ll attach a few larger size pictures too. I’d love to be one of your featured artist. I’m attaching a couple of images- feel free to pick the one you like best. I’m more than happy to answer any questions you or your students might have. I have realized that real masters in their arts are not affraid tio share their “secrets” because they are sure of themselves and know that the secret is WORK AND WORK AGAIN. When people don’t want to share it’s mostly that they may have found a little “trick” and are affraid that we would see they are not so good. I know a lot of artist do not like to share. And you probably know we did not invent this art. Been around for many many years. We just add different images that please ourselves. When you share it give pleasure and some one was nice enough to share with me, even if it were in a book form, it take lots of time to write. Our journey is never alone. When an artist try to copy other artist it will always look like they did. Yes, practice, practice, practice, which is what we are doing in every jewel we make, no mater how long we have been playing! Eddie, not at the moment. I teach the technique if you would like a private class.